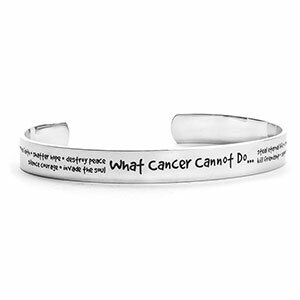 This stainless steel What Cancer Cannot Do bracelet is pre-engraved in black with the words, 'corrode faith - shatter hope - destroy peace - silence courage - invade the soul - steal eternal life - conquer the spirit - cripple love - kill friendship - suppress memories.' The total size is based on the length of the cuff bracelet plus the 1 3/4 opening. It can bend to adjust to a smaller size.